People have always said that I am a dreamer, and rightly so. When I was a child, my teachers remarked to my parents how I was a day dreamer and was always staring out the classroom window. Looking back, I don't know what I was thinking about, but I do know that I wasn't thinking about the math problems that were on my desk. This young girl that lives in another world in her mind has continued into adulthood. I have been raising 4 boys for the past 17 years and during these years of motherhood I feel like that I would have shriveled up and died inside if all I did was care for my family and live the life that one would only see on the outside. Whether you have a full time desk job in a gray space or you're feeding babies and are up to your elbows in peanut butter and jelly, the monotony of every day can be a tough reality to face day in and day out. Even though I was not able to live out all the creativity that I wanted to at different stages of my life, I have found ways to keep my brain in motion to help me to keep being a dreamer. We should all be dreamers! Life would be a happier place if we allowed ourselves to break free from the monotony and be inspired. What do you fill your brain with that keeps you dreaming and inspired? What is in your mind's eye? 1. Visuals: Collect images that are inspiring to you and that make you feel happy. I truly believe that the reason that Pinterest is so successful is because it allows people to to fill their senses with things that take them away to other places. It breaks the visual monotony of what we see every day and allows us to dream. Dream about those images when you are scrubbing toilets or working on a deadline for work. It doesn't have to distract, just give those images a minute of stage time in your brain and let it help fuel you to carry on and complete your current task at hand. What's on your favorite pinterest board? 2. Believe that anything is possible: The definition of Optimism is "hopefulness and confidence about the future or the successful outcome of something." It is this positive outlook that will spur you on to think out of the box and dream of possibilities that may look impossible to others. What do you think is impossible but something that you would love to experience or accomplish? Dream about those things. 3. Be a future person: What drives me and motivates me is having goals for myself and a mental bucket list that I am contemplating. Right now my future goal is having an art studio in the woods somewhere, possibly a treehouse, and there is nothing anyone can do to take that vision away from me. The thought of this treehouse alone is enough to keep my brain dreaming and gets me through the most boring of days. What is an unrealistic dream that you have for your future? Dream about that. 4. Look and Listen: Fill your brain up with whatever you find inspiring and/or motivating. I just read "Big Magic" by Elizabeth Gilbert which was all about creative living beyond fear. That was a great read! Try to make time to read, and if you don't have time, then listen to podcasts! I only started listening to podcasts last year and after the first one I was hooked! What I love about them is that you can multitask as you listen to them. I listen to them as I drive, work out at the gym, cook dinner, and of course while I do art. 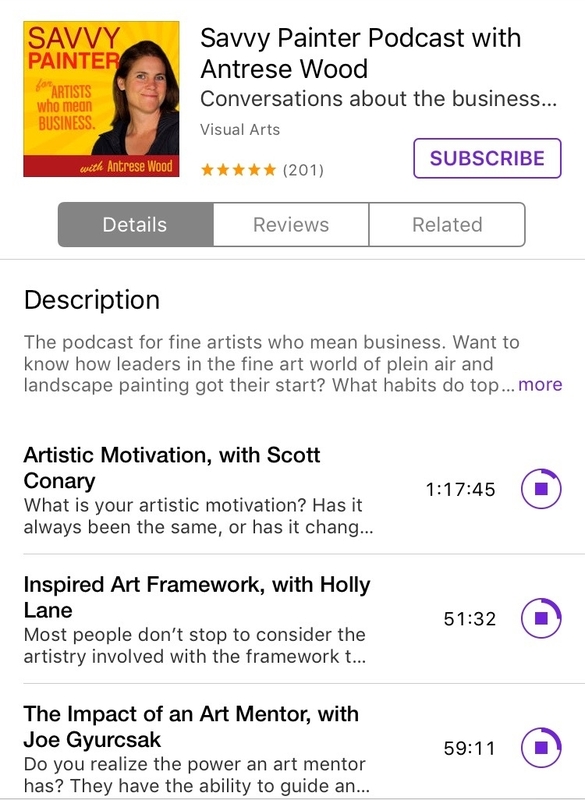 For you artists out there, I have some suggestions of podcasts that are my top two favorites. 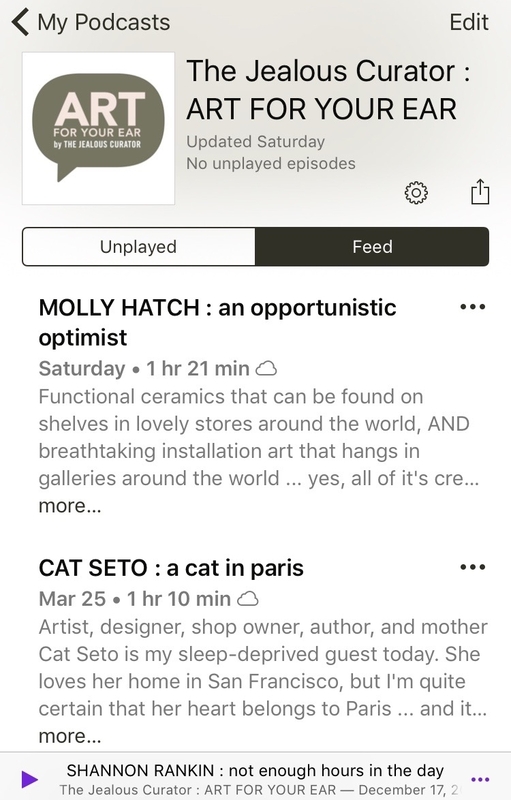 The Jealous Curator: Art for your Ear, and Savvy Painter Podcast with Antrese Wood. They interview artists and I love learning about people's stories and their personal journeys as artists. These conversations continue to play in my mind long after they are over and give me so much to ponder. What are you reading and listening to?